Friends of the Salem Church will be hosting an “Old-Fashioned Salem Christmas” program on Saturday, Dec. 20, at 7:30 p.m. at the Salem Church. Festivities get under way at 5 p.m. with Steve Lahr giving free wagon rides (sleigh rides if it snows) in the vicinity of the church and cemetery grounds. 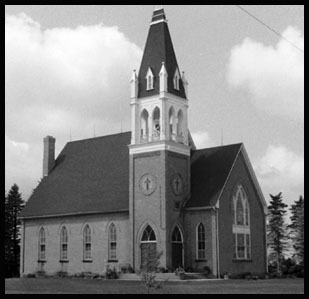 Traditional homemade Christmas cookies, hot chocolate, and apple cider will be served at the church five miles north of Paynesville on Stearns County Road 33 and a mile west on 220th Street. At 7:30 p.m., the old church bell will ring, signaling the start of the service. Curt Wegner will deliver a welcome to those attending and Paynesville native Dr. Lowell Gess will read scripture. Pastor Ric Koehn of the Paynesville United Methodist Church will lead the congregation in prayer. Presenting special music will be Lon Moon, Marshall, and Butch Becker, Cambridge. An impromptu choir with members coming from that evening’s congregation will sing old familiar Christmas carols. The nativity scene will be acted out by adults who were Sunday school children in the 1960s at Salem Church. Among those sharing memories of the past at Salem will be Jenny Manz Becker plus members from that evening’s congregation. Becker will also be leading a children’s sermon. The program will end with the congregation singing the first verse of Silent Night in German and then in English. At the end of the program, the traditional bags of peanuts, hard candy and apples, will be handed out to everybody attending the program. The program was made possible with gifts to the restoration fund. The gifts have provided for the purchase and installation of a heating system. The stairs to the basement have been stabilized and the restrooms will be in working order. The sanctuary will be decorated by the Les and Ruby Snyder family, to rekindle the memories of its past. A 20-foot spruce tree has been donated by the Dave and Craig Heitke families, Paynesville. Those attending the program are being asked to bring a gift of toys and canned foods which will be donated to the community center. The Christmas offering will be divided between the Salem Restoration Fund and the Paynesville Community Center. The documentary video tape of Salem Church filmed last August will be made available during the program. Proceeds from the tape sale will be used in the restoration of the church.